Time for another trip into the darker recesses of the DVD release schedule. With a remake about to hit the cinema it’s prime time to revisit Evil Dead II (Studio Canal) ●●●●●, and it’s still an absolute classic. It’s the archetypal ‘cabin in the woods’ horror as four friends inadvertently unleash the power of the Book of the Dead. Packed with slapstick gore and dripping with blood for a perfectly balanced horror comedy. 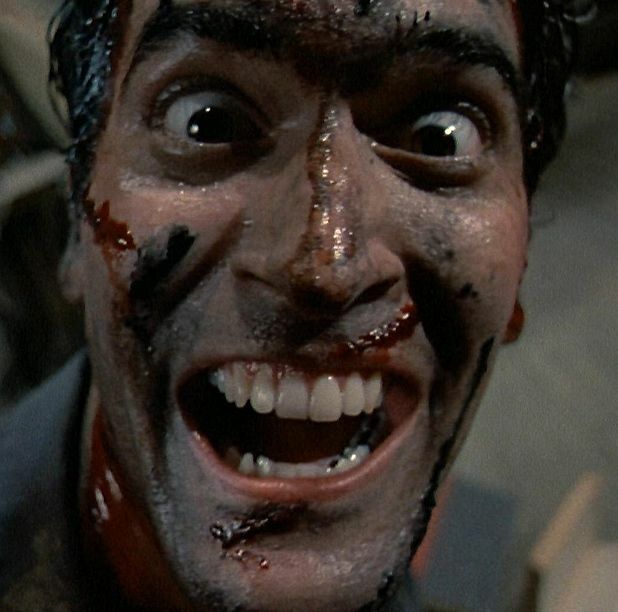 Bruce Campbell steals the show with a wonderfully physical performance and some killer one liners. Funny and gory, Sam Raimi exhibits all the wildly inventive hyperactive directorial quirks that have led him to the top table in Holly wood. And it looks amazing on this new Blu-ray. One of Wes Craven’s lesser known films Deadly Blessing (Arrow Video) ●●● is also getting a Blu-ray release. This kooky tale of a creepy Amish-style community stars a very young Sharon Stone, it’s a little slow but the end is just about bonkers enough to be worth sticking around for. Another lesser known film from another master of horror, George A Romero’s Knightriders (Arrow Video) ●●●, a mix of King Arthur and Mad Max as Ed Harris leads a band of armoured road warriors who joust at medieval fayres. Billy (Harris) gets lost in his own fantasy struggling to bring his ideas of heroism and honour to bear on the modern world. It perhaps takes itself too seriously but it’s still nice to see Romero’s rarer films getting such a solid release. There’s always been a healthy mini-subgenre of Sasquatchploitation movies but The Bigfoot Tapes aka Bigfoot County (Signature Entertainment) ● is a found footage cash in that’s not bad at first but it soon becomes evident that not much is going to happen. You’ve seen kids running about in the woods pursued by an unseen evil in far better films like Evidence, The Last Broadcast and, of course, The Blair Witch Project. Plus the end shot makes the whole film feel like it was just one big build up to a final gag. You wait ages for a Bigfoot movie then two come along at once. Dear God No! (Monster Pictures) ●● is another of those deliberately retrograded grindhouse movies, crammed full of biker gangs, medical experiments and, you guessed it, Big Foot. It’s a relentlessly sleazy, über nasty little number that forgets all this trash needs a sense of humour or it just tiresome in it’s unrelenting desire to shock (and this really isn’t for the squeamish - there’s one particularly nasty murder that should offend nearly everyone). Midnight Son (Monster Pictures) ●●● is a low key, down beat romance akin to Romero’s Martin as a young loner ponders whether he’s a vampire or not. The low budget means the acting varies wildly but there are some nice touches and a few great ideas on display making writer/director Scott Leberecht a name to keep an eye on. Keeping things low budget, The Fallow Field (Monster Pictures) ●●● is a British chiller that has a unique concept. Matt Sadler (Steve Garry) wakes after yet another black out, missing several days of his life, his investigations lead him to a field with unholy powers. To say too much would spoil all the twists and turns. The lack of money shows through the cracks but Michael Dacre is nicely menacing as the gruff farmer, again it would be great to see what writer/director Leigh Dovey could do with a proper budget. More indie action, this time from Ireland and considering it’s proliferation the world of horror it’s surprising The Inside (Monster Pictures) ●● is only our second found footage film of the month. Starting as a birthday party that ends in violence after being gatecrashed by three radges it takes a turn for the supernatural about 30 minutes in. There are a couple of great creepy moments (the creature/ghost/whatever-the-hell-it-is design is nicely disturbing) most of the film is grating with it’s shaky cam and contestant screaming. More Irish horror: Stitches (Kaleidoscope Home Entertainment) ●●●● is a lot of fun. Geordie stand-up Ross Noble plays a killer clown back from beyond the grave to wreak revenge on the kids that killed him. There are plenty of inventive clown themed death sequences and like all good horror comedies Stitches is full of gory gags but takes the villain seriously. Films set in very specific, very small spaces have become a subgenre all their own: we’ve had phone boxes (Phone Booth), ski lifts (Frozen) and lifts (take your pick from Devil, Elevator or Down). Now 247°F (Anchor Bay) ●● gives us sauna-based horror as teens become trapped in the steam room and start to boil to death. Surprisingly engaging for the first 45 minutes, 247°F then throws it all away as the cast become more hysterical and the fact no one has found them becomes increasingly unbelievable by the second. We end with a double bill of action titles. The Man with the Iron Fists (Universal) ●●● is an homage to old school 70s kung fu films directed by RZA (Wu-Tang Clan) and co-written by Eli Roth. RZA also stars as a stoic blacksmith who gets caught up in a war between Silver Lion (Byron Mann) and The X-Blade (Rick Yune). There are nods to Enter the Dragon, A Fistful of Dollars and Shaft with plenty of fight sequences complete with some thrilling wire work. Universal Soldier: Day of Reckoning (Studio Canal) ●●●● is a dark introspective action film. The fight scenes are grim and gritty, there’s a particularly brutal shoot out in a brothel that’s turned into a slaughterhouse. Jean-Claude van Damme and Dolph Lundgren’s roles add up to little more than cameos, the majority of the runtime is spent with Scott Adkins who is trying too find who killed his family and why. There’s an Apocalypse Now vibe to the final act with JVCD as a Colonel Kurtz character, alongside a brilliantly staged extended real time action sequence (mirroring a similar scene in much over looked predecessor Universal Soldier: Regeneration). Far better than the fourth (sixth if you count the TV movies) instalment in a 21 year-old action series has any right to be.